We're less than 24 hours away from Samsung's Unpacked 5 event in Barcelona, where the Galaxy S5 is expected to be the guest of honor. We'd also thought that the recently-leaked Gear 2 and Gear 2 Neo (nee Galaxy) would be revealed there, but Samsung issued a press release instead. 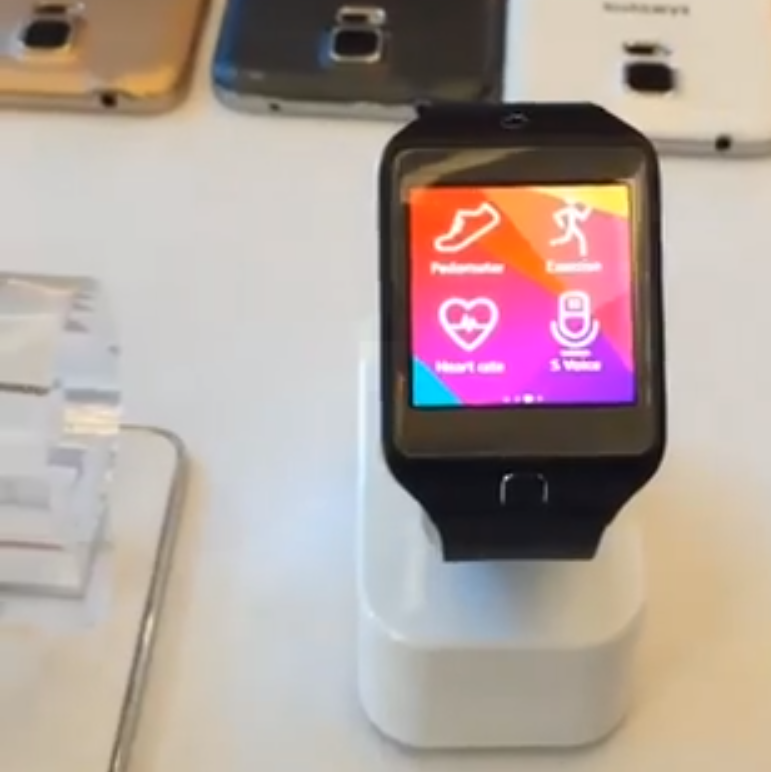 Now one Instagram video of the Gear 2 seems to have spilled the beans on the S5, at least in a mild way. The Instagram post has been taken down, but here's a mirror of the short video on the YouTube account of GadgetLeaks. Look closely at the beginning and end of this video, and you can see three Samsung phones in the background, one white, one black, and one gold/bronze. The shapes of the camera and lens modules are distinctly different from the Galaxy S4, with a more squared-off look. The devices themselves look about the right size for a 5-inch flagship device. With the quality and duration of the video, that's about all we can say. This could certainly be the Galaxy S5 - the video looks like a pre-event briefing for some kind of media outlet. The proximity of the Gear 2, another new product, could indicate that. This could also be something else entirely, or even a dummy phone put there for decoration. But considering the timing and all the other indications of the Galaxy S5 event tomorrow, it seems like a pretty solid connection. Android Police will be covering the Unpacked 5 event live, as well as the rest of Mobile World Congress, which begins on Monday morning. Source: Instagram (removed), thanks, T.!